Supplying a full range of equipment for fall protection across all sectors. SKYLOTEC is a worldwide leader in all areas, in which safety at heights is important, and supplies innovative and exceptional products and services. Whether you use Personal Fall Protection Equipment (PFPE) on a daily basis or just occasionally, SKYLOTEC has the right products for your line of work. Indoor climbing wall or outside in the mountains? 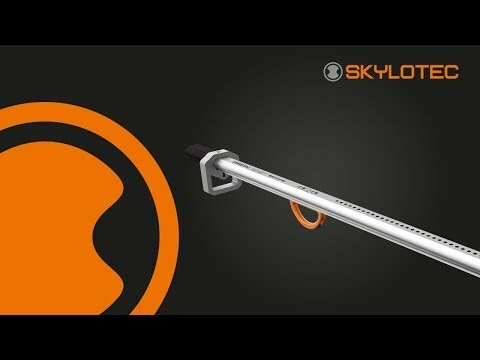 Put your trust in SKYLOTEC. The experience and knowledge we have gained in industry goes straight into the development of our sports products! Whether horizontal or vertical, SKYLOTEC not only supplies the right products, we will also help you with your risk assessments and the assembly of your permanent fall protection systems. The correct use of our fall protection products is absolutely crucial. You can learn how to use our equipment safely, and much more besides, at our training sessions certified according to GWO / IRATA / FISAT / ISO 9001 standards at the Vertical Rescue College. We can also provide on-site training or work with you to develop rescue concepts to suit your own individual risk assessment.